Swinburne wrote about many taboo topics, such as lesbianism, cannibalism, sado-masochism, and anti-theism. His poems have many common motifs, such as the ocean, time, and death. Several historical people are featured in his poems, such as Sappho ("Sapphics"), Anactoria ("Anactoria"), Jesus ("Hymn to Proserpine": Galilaee,, La. "Galilean") and Catullus ("To Catullus"). Swinburne spent summer holidays at Capheaton Hall in Northumberland, the house of his grandfather, Sir John Swinburne, 6th Baronet (1762–1860), who had a famous library and was President of the Literary and Philosophical Society in Newcastle upon Tyne. Swinburne considered Northumberland to be his native county, an emotion reflected in poems like the intensely patriotic 'Northumberland', 'Grace Darling' and others. He enjoyed riding his pony across the moors, he was a daring horseman, 'through honeyed leagues of the northland border', as he called the Scottish border in his Recollections. In the period 1857–60, Swinburne became a member of Lady Pauline Trevelyan's intellectual circle at Wallington Hall. After his grandfather's death in 1860, he stayed with William Bell Scott in Newcastle. In 1861, Swinburne visited Menton on the French Riviera, staying at the Villa Laurenti to recover from the excessive use of alcohol. From Menton, Swinburne travelled to Italy, where he journeyed extensively. In December 1862, Swinburne accompanied Scott and his guests, probably including Dante Gabriel Rossetti, on a trip to Tynemouth. Scott writes in his memoirs that, as they walked by the sea, Swinburne declaimed the as yet unpublished 'Hymn to Proserpine' and 'Laus Veneris' in his lilting intonation, while the waves 'were running the whole length of the long level sands towards Cullercoats and sounding like far-off acclamations'. 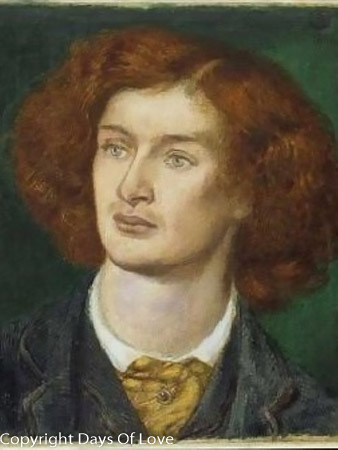 At Oxford, Swinburne met several Pre-Raphaelites, including Dante Gabriel Rossetti. He also met William Morris. After leaving college, he lived in London and started an active writing career, where Rossetti was delighted with his 'little Northumbrian friend', probably a reference to Swinburne's diminutive height—he was just five foot four. Swinburne was an alcoholic and algolagniac and highly excitable. He liked to be flogged. His health suffered; and, in 1879 at the age of 42, he was taken into care by his friend, lawyer Theodore Watts-Dunton, who looked after him for the rest of his life at The Pines, 11 Putney Hill, Putney. Thereafter, he lost his youthful rebelliousness and developed into a figure of social respectability. It was said of Watts that he saved the man and killed the poet. Swinburne died at the Pines on 10 April 1909 at the age of 72 and was buried at St. Boniface Church, Bonchurch on the Isle of Wight.